CES 2015: TCL to launch 55in 4K Quantum Dot TV H9700 in Europe | What Hi-Fi? If some of the new TVs we've seen announced at CES 2015 are anything to go by, it looks as if 2015 could well prove to be the year in which a new screen technology establishes itself – quantum dot. LG is one of the manufacturers to have promised new 4K sets with quantum dot technology this year – and it's not alone, with TCL's 55in 4K quantum dot screen appearing on the Las Vegas showfloor. We first heard about TCL's TV at IFA 2014 back in September, with the technology thought to work in a similar way to OLED with light supplied on demand. And now TCL is launching its set in Europe. 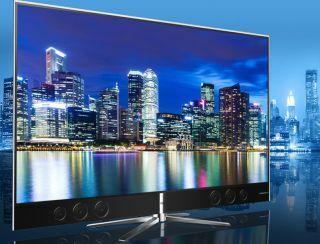 TCL Multimedia and QD Vision have confirmed that the 55in TCL Quantum Dot TV H9700 – already available in China – is coming to "targeted overseas market" such as Europe and is coming "soon". According to TCL, Color IQ Quantum Dot technology lets the H9700 achieve 110 per cent of the full-gamut NTSC colour performance – by comparison, LCD TVs are said to deliver 60-70 per cent. “Our Quantum Dot TV H9700 has been extremely well-received by consumers in China, and we look forward to making it available to a broader market this spring," said TCL Multimedia CEO E Hao.